1. The Harry Potter series got the Funko Pop treatment! Now you can find the cute small Funko Pop figurines of all your favorite Harry Potter characters almost everywhere. 2. Lily and James are real soulmates, even according to their patronuses. Lily’s is a doe and James’s is a stag. 3. Hermione Granger almost had a sister. Yeah, J.K. Rowling herself revealed in an interview that she had this in mind, but since this character didn’t appear in the first books, it was too late to introduce her later and she let it slide. 5. Inside the Wizarding World, visitors have the opportunity to ride the Hogwarts Express between King’s Cross and Hogsmeade Station. 6. The Wizarding Wireless Network is a place where wizards embrace culture. Just like a streaming service. 7. Boggart is a shape-shifting type of creature that takes the form of the fear of a person. 8. After the release of all the seven books, J.K. Rowling launched the website Pottermore in 2012. 9. Even though it’s all about the school of magic and spells, only 4 incantations make an appearance in the first book. 10. 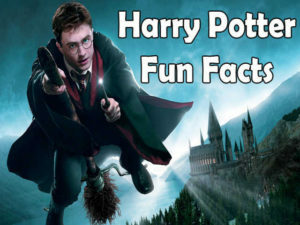 The fifth book in the series, Harry Potter and the Order of the Phoenix, was sold in over 5 million copies, and wait for it, in just the first 24 HOURS of its release! 11. There’s a shop in Los Angeles called Whimsic Alley. It’s a remake of the wizarding Diagon Alley. 12. Joanne has a daughter from her previous short marriage called Jessica. 13. After finishing her studies, Luna Lovegood ended up marrying Rolf Scamander. 14. After they got married, Harry and Ginny named their children after people that meant to Harry a lot. Their children are called James Sirius, Albus Severus, and Lily Luna. 15. Several American actors were declined for roles in the Harry Potter movies including Robin Williams. The reason was that Rowling wanted only British or Irish actors aboard. 16. The fifth, sixth, seventh, and eighth installment of Harry’s adventure on the big screen all had David Yates as the director. 17. M. Night Shyamalan was once interested to direct a Harry Potter movie. 18. The real Draco aka Tom Felton never knew anything about the films he was going to play in. That’s because he hasn’t read any of the books before coming to the audition. 19. In 2016, J.K. Rowling collaborated with Jack Thorne and John Tiffany to create Harry Potter and the Cursed Child – a two-part play. 20. Hogsmeade is a small village near Hogwarts and is the only place where only wizards live. There isn’t a single Muggle. 21. In the third book, on Christmas, Trelawney doesn’t want to sit on a table with twelve other people already seated. This is because she would be the thirteenth occupant of a seat and the one that stands up first would die. 22. Dr. Neill Murray is Jo’s husband. They’ve been married since 2001. 23. When the Horcrux inside Harry was destroyed by Voldemort, he could no longer speak Parseltongue. 24. Most of the scenes in the Harry Potter movies were shot in Leavesden Studios in Watford. 25. Rhys Ifans, who plays Luna’s father, said that he has never read the books. However, he decided to take on the role, because he loved the idea of working with a cast composed of such famous stars. 26. Hermione has pretty big teeth in the books and they wanted the same thing with Emma Watson. But, she had a lot of trouble speaking, so the fake buck teeth were out. 27. Sirius Black’s tattoos are inspired by the ones that Russian gang prisoners have. It means that that person is to be respected and feared. 29. The first of the Fantastic Beasts movies is called Fantastic Beasts and Where to Find Them starring Eddie Redmayne as the magizoologist Scamander. 30. Butterbeer is one of the most popular beverages in the wizarding world and it tastes a bit like butterscotch.